Checking the Automatic Publish radio button will publish DWF or DWFx or PDF files upon your selected action. So you can set AutoCAD to create DWF or PDF files when you save or close a file. This may be overkill for most of you. Creating a DWF or PDF every time you close a file may be overdone. Specifies where DWF or PDF files are saved when you publish drawing sheets. Publish on – Specifies when the publishing takes place. You have several options here. Location – Specifies a directory where exported files are saved when you publish drawings by selecting the following options in the list. This is not set in the Files Tab of Options. Click the […] button to specify a new location to save the published drawings. Include – Specifies whether to publish the model, the layouts or both the model and layouts when you publish drawings. 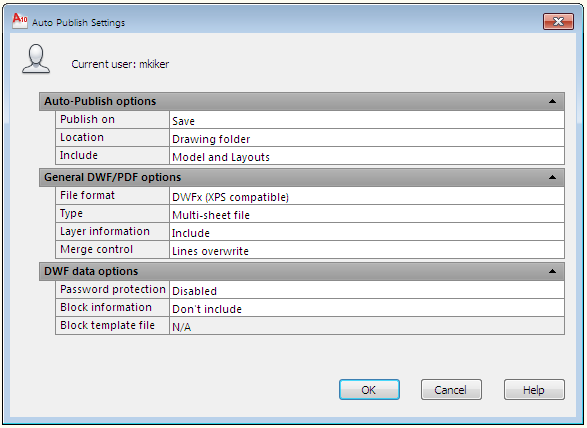 Specifies options for creating a single-sheet or multi-sheet DWF, DWFx, and PDF files. File Format – Specifies whether the DWG should be published as a DWF, DWFx, or PDF file. What is DWFx? DWFX is an Autodesk DWF XPS Document. Autodesk has teamed with Microsoft to seamlessly integrate DWF technology with Windows Vista using the XML Paper Specification (XPS). DWFx files can be opened directly within Microsoft`s XPS Viewer, which is automatically installed with Microsoft Vista, bundled with .NET 3.0, and is available as an optional download for Windows XP users. Type – Specifies that a single-sheet or a multi-sheet is generated for all the sheets listed in the Publish dialog box. Layer Information – Specifies whether layer information is included in the published DWF, DWFx, or PDF file. Note: Layer information for 3D DWF entries does not get published. Merge Control – Specifies whether overlapping lines overwrite (the top line hides the bottom line) or merge (the colors of the lines blend together). Lists and allows you to specify the data that you can optionally include in the published file. Specifies options for protecting DWF, DWFx, or PDF files with passwords. Specifies whether block property and attribute information is included in the published DWF, DWFx, or PDF files. Allows you to create a new block template (DXE) file, edit an existing block template file, or use the settings of a previously created block template file. This only becomes available when you set Block Info to Include.